There are CRT services at Etruria Junction so we stopped to dispose of the rubbish and top up the water. It’s a lovely spot and we might spend more time here on the way back. James Brindley is watching us! I hadn’t realised this famous canal builder spent much of his life in Leek which just happens to be our current destination! This isn’t our first time on the Caldon Canal. In 2005 we hired a Black Prince boat for two weeks and completed the Cheshire Ring with a couple of days to spare. The additional time allowed us to go up the Caldon as far as Engine Lock. Later we read this was probably the least attractive part of the canal! 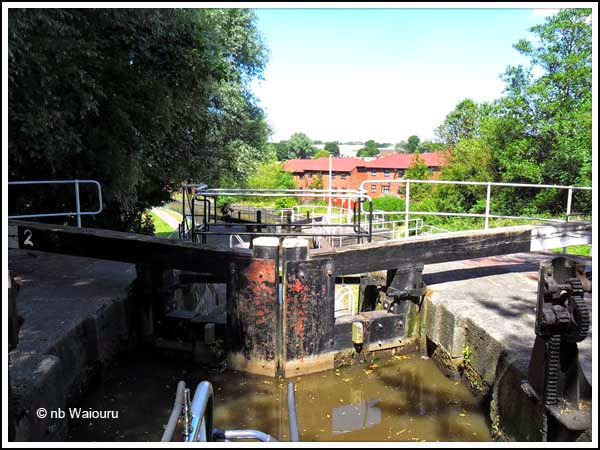 There is a staircase set of two locks at the start of the canal. A passing boater advised us there was a submerged double bed in the pound above the next lock. Whilst we didn’t see a bed a four foot wide mattress floated past us. I didn’t stop to retrieve it as our bed base is five foot! 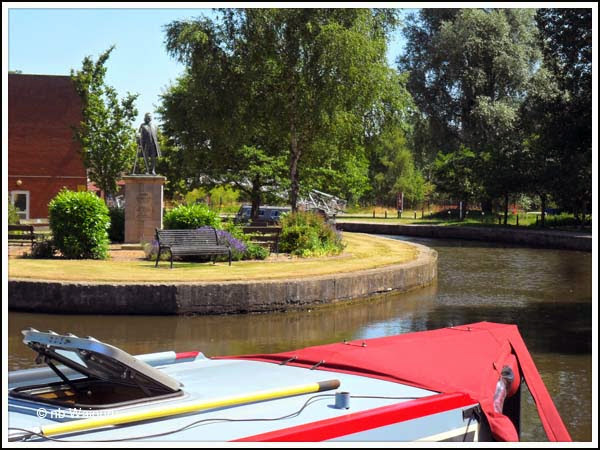 Whilst there are mooring rings on the edge of the canal adjacent to the park above Planet Lock and the area looked tidy we didn’t stop as it seemed to be too close to a residential area. It’s been eight years since we were last this way and the redevelopment is obvious. New residential dwellings are replacing derelict factories. 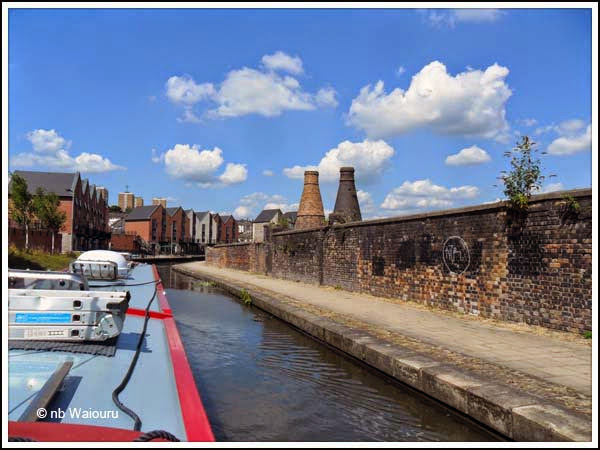 It looks like some thought has also been given to improving the state of the canal with a long line of new moorings between the A50 and the lift bridge. Two bottle kilns remain. Hopefully they will not be demolished as they add ‘character’ to the area. Note the new housing on the opposite bank. The canal then starts to give the impression it’s become rural but if you look closer you’re never far from housing. The towpath surface along this part of the canal is wide, well maintained and has a good bitumen surface. We were hoping for a mooring near The Miner’s Arms pub but they were all occupied and so we pressed on finding a straight piece of armco piling just short of Engine Arm Lock. Despite appearing to be rural we had numerous walkers and cyclists pass Waiouru well into the evening. FROG SWAMP - Crick offering this year from our builders is ahead of you though not on Leek Arm. Do occasional blog. New liveaboards. Suggested they look out for you.